I have no idea how to read a map. Living in an age where all destinations are just a click away in a Google app makes you realize how much less adept millennials are at certain basic skills. 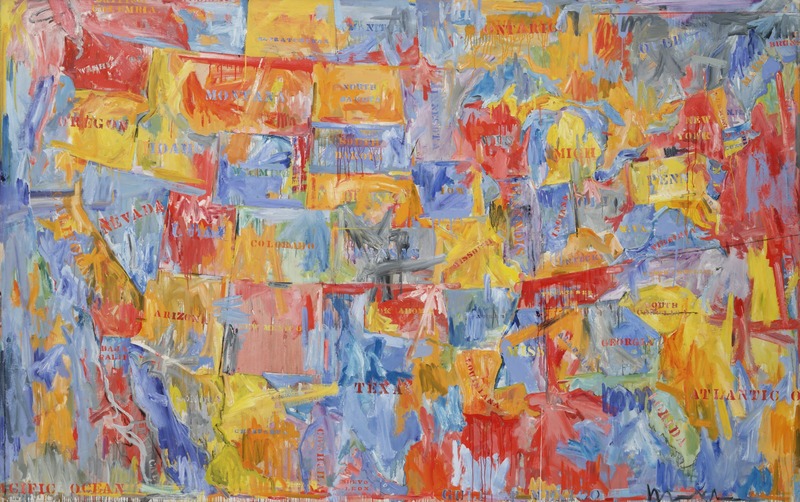 Paintings like this one by Jasper Johns, while reminding me that if the apocalypse ever hit I would be totally screwed, also conjure up undeniable feelings of patriotism. Johns loves to paint images of the everyday. He is obsessed with "the idea of knowing an image rather than just seeing it out of the corner of your eye." So what better way to do that than to paint things everyone knows? It was actually his artistic counterpart and lover Robert Rauschenberg that motivated Johns to begin working with images of maps. In 1960 Rauschenberg gave him a coloring book version of a map of America meant for children. Rather than seeing it as an insult, Johns was inspired. People love the work of Jasper Johns because it is so relatable. I mean, everyone knows what a map is when they see one, and they even begin to associate themselves with the universal object it is. “Hey look! Sartle is located in San Francisco, CA. That’s right there!” Now this work has become about me, quite possibly my favorite subject. As Johns explained in a somewhat convoluted way (he was notorious for not explaining his work), “I am concerned with a thing's not being what it was, with its becoming something other than what it is.” See, Johns was making this work in the wake of Abstract Expressionism, which in a nutshell, was a movement characterized by a bunch of manly dudes feeling a lot of emotions way too hard and then capturing that moment in time. One can never completely understand that work because those paintings are a reincarnation of the artist themselves, and are not really about the viewer. Then Johns came in and was like, nah, let's make some art that everyone can relate to! And thus, the world was given benign images of flags and maps, and people ate it up. Pop art was now the word on everyone’s lips, and Johns was one of the grandpappies of this movement. So while this painting for me is a solemn reminder that I need to get it together and learn how to read a map, I would prefer to ignore my shortcomings and rather see it as one of the great pieces of art that inspired one of America’s favorite artistic movements. The painting measures 198.2 centimetres (78.0 in) by 314.7 centimetres (123.9 in). Johns was inspired by a gift from Robert Rauschenberg of some mimeographed outline maps of US states, of the sort that can be colored in by schoolchildren. Johns was attracted to an image that is ubiquitous but "seen and not looked at, not examined", effectively a found object. He copied the outlines to a large canvas, to which he added bright splashes of red, yellow, and blue, sometimes mixed, with accents of black and white. His rough brushwork resembles an Abstract Expressionist style or the late works of Cézanne. Although the outlines of the states are recognisable, the colors do not always respect state borders, perhaps suggesting the blurring of boundaries and homogenisation of post-war American society, reinforced by the mass-produced effect of the stencilled names. It has been suggested that the painting may be a visual pun, as Johns "deliberately put American painting on the map" in the 1950s. Johns considered that he was painting a map, not making a painting of a map. Check out the full Wikipedia article about Map (painting).